Pre-fill at least 1 of every 3rd unit with water ballast. Rest of the units automatically fill with the rising flood waters. All of our flood barrier systems work to a height of approximately 70-80%. A freeboard is required when in use. If the wall or ground surface is not adequately flat (i.e. where Floodstop’s foam gaskets are in contact) the seepage rate may vary - it is recommended to have a small pump on hand to pump away excessive leakage if required. The system is not recommended for use on gravel. 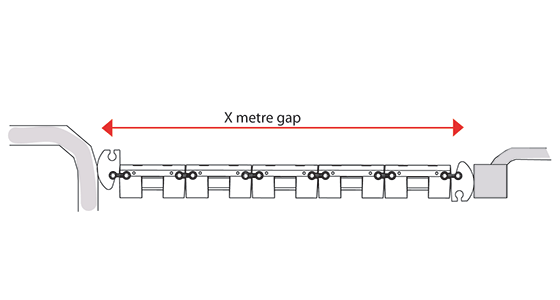 To get a quotation and deployment plan showing how Floodstop would be arranged at your location please contact us with the measurement(s) of the opening, delivery postcode and any photos you may have to hand. "We are using the system and it is working great; Floodstop is keeping our platform and car park open and safe to our customers and colleagues during recent extreme weather and associated flooding"
“The system we purchased from you for use at our house in Downton has proved invaluable over the last couple of months." “We have had to use the Floodstop over the weekend and what a GREAT job it did for us!"